This was a wedding at home in a large garden at a house in Four Oaks 2007. The event was a traditional four course waitress served meal for 100 guests. The guests arrived through the house to a reception in a 20ft x 40ft marquee on the patio which was attached to the house, additional access to the outside through aluminium doors. This extended over the flower beds and small shrubs to the main Marquee (40ft x 50ft) on the upper lawn- via the garden steps. The decor of the whole Marquee consisted of Ivory pleated linings with an ivory swags with wrought iron chandelier lighting. The Marquee was carpeted with charcoal marquee carpet, and had a parquet hardwood dance-floor (15ft x 15ft). The guests were seated at 5ft round tables with banquet chairs and chair covers. The caterers serviced the whole event from an attached catering Marquee (10ft x 15ft) connecting the main Marquee to the kitchen of the house. 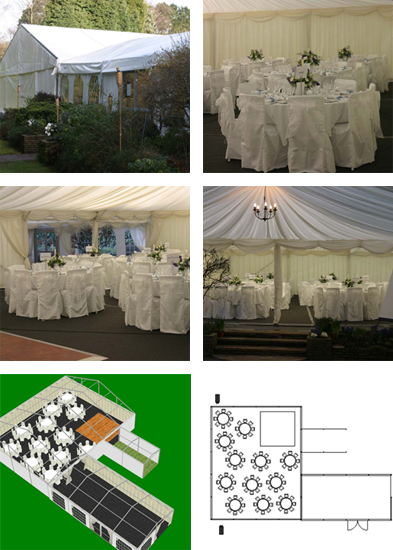 As a February wedding the Marquees were heated with two 40KW indirect heaters.